But how can we use this network data we’ve gathered to give us some more concrete insights we can use in our campaigns? For example, to identify influencers, segment audiences, and understand what content is interesting to them. The fundamental insight of social network analysis is that a person’s position in the network is an indicator of how influential they are. This is because influential people are more likely to acquire connections, but also because having more connections in itself makes you more influential. Put another way, it’s difficult to imagine how someone could be influential on Twitter without being followed by others interested in their topic. Without followers, how would they be able to express their influence? And if they somehow managed to be influential anyway, wouldn’t they then acquire followers? Once we accept this link between connections and influence, we can use algorithms provided by network software such as NodeXL and Mathematica to rank members of a network, and find out who is most influential. The most commonly used algorithms are eigenvector centrality and PageRank, a variant developed by Larry Page of Google. Algorithms like these reward people with lots of followers or relationships, but they also reward people for relationships with others who are themselves well-connected. In other words, these algorithms allow influence to be passed on. They search out those who are not only well-connected, but are connected to others who are central. 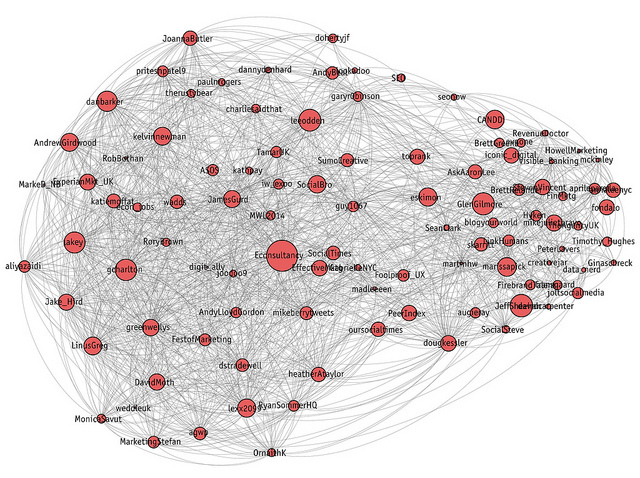 The ten most influential users in our Econsultancy network. Econsultancy publishes independent research, analysis and advice on digital marketing, social media, ecommerce, SEO, mobile and tech for businesses. Author: Optimize. CEO: @TopRank Online Marketing agency w/insights on integrated search, social media & content marketing. Proud dad, world traveler, foodie. Editor in Chief at Econsultancy. Blogs about ecommerce, mobile commerce, email marketing and more. Director of Product Development at Econsultancy, writer & music fiend. i’m a big fan of ecommerce, emarketing, ebusiness, & selected other words beginning with e.
Sr. #SocialMedia #Marketing Manager at Euromoney Institutional Investor @iimag…Lover of great food & wine, #soccer fanatic, #yankees fan and #shopping addict! The Econsultancy account itself is the most influential as we’d expect, even though accounts with far more followers were picked up in our network. The fashion retailer ASOS (@ASOS) has more followers than Econsultancy (more than half a million compared to Econsultancy’s c. 150,000), but because it is less relevant to this community is ranked far lower in terms of influence at number 51. Likewise, the eigenvector centrality algorithm has placed two employees of Econsultancy in the top 10 (@gcharlton and @lakey), correctly working out that they are very relevant to the community we’re looking at even though they also have fewer followers than ASOS. A variant measure when we’re looking for influencers is ‘betweenness’. Rather than finding people who are at the centre of communities, algorithms like betweenness centrality find those who are on the most paths between others in the network. People with high betweenness tend to be the innovators and brokers in any network. They combine different perspectives, transfer ideas between groups (or decide to withold them), and get power from their ability to make introductions and pull strings. Small business sales and marketing, mountain biking, photography, and Mac fanatic. Owner of Digital Juggler, Ecommerce consultancy & co-host of #EcomChat – weekly ecommerce discussion Mondays 1pm GMT. Please join in! MD at Iconic Digital, leading London based digital marketing agency. Follow me for industry news, marketing advice as well as useful hints and tips! Our Social Times is a social media agency working with clients in the UK and Europe. We also run great events.